Annie's guest on this episode is the first of many more guests in the brand new series called "AMAZING ATHLETES." NICK KERN who hails from the city of Brea, Calif.
Nick is an NCAA Baseball Champion, recipient of the Wilma Rudolph Student-Athlete Achievement Award, and the 2017 Muscle Milk Athlete of the Year. Nick attended UCLA from 2013 to 2017 earning a degree in Physiological Science while competing for the Division 1 baseball team. While at UCLA, Nick’s dreams and aspirations were put on hold when he was diagnosed with Ulcerative Colitis, an autoimmune disease that put him in the hospital for over 50 days, requiring 5 surgeries to eventually remove his large intestine. 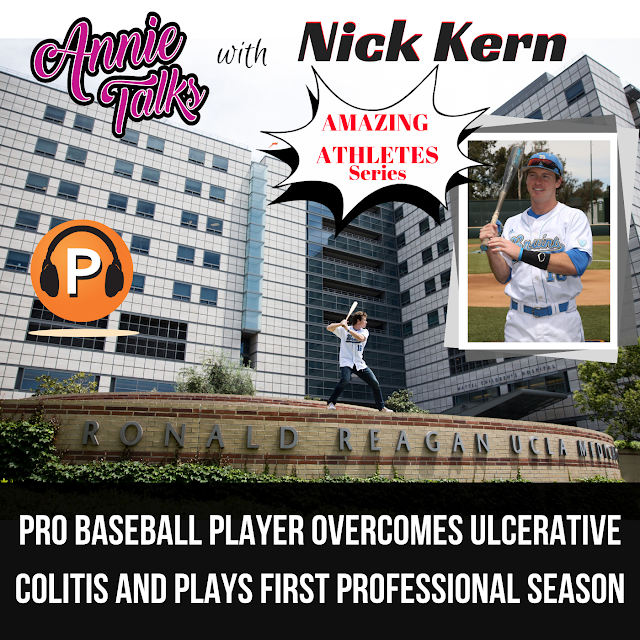 Nick returned to baseball for the 2017 season at UCLA, and despite continued health complications, he is playing professional baseball and giving back to the community by coaching high school baseball.